The universal telephone preinstallation GSM II makes it possible to play back music via Bluetooth® from the devices such as MP3 player, mobile phone or notebook. To ensure the music can be played back via Bluetooth®, you must first pair the device with the hands-free system in the Phone - Bluetooth - Media player menu. The music playback process is performed on the connected device. The universal telephone preinstallation GSM II ensures that the music played back via the hands-free system can be controlled with the remote control » page 99, Voice commands. The device being connected must support the Bluetooth® A2DP profile; refer to the operating instructions for the relevant device being connected. The multifunction steering wheel has buttons for operating the basic functions of factory-fitted radio and navigation system » Fig. 101. The radio and navigation system can of course still be operated on the devices. A description is included in the relevant operating instructions. If the side lights are switched on, the buttons on the multifunction steering wheel are illuminated. The buttons apply for the respective operating mode of the current radio or navigation system. The following functions can be completed by pressing or turning the buttons. 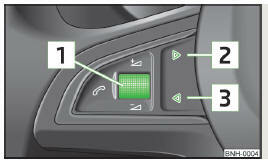 The functions of button 1 are different for vehicles fitted with a universal telephone preinstallation GSM II » page 95. The loudspeakers in the vehicle are adjusted to the power output of the radio and navigation system of 4x20°W. The AUX input is located below the front armrest and is marked with . The MDI input (AUX and USB) is located at the front under the storage compartment on the passenger side. The AUX- and MDI inputs are used to connect external audio sources (e.g. iPod or MP3 player) and to play back music from these devices via the factory-fitted radio or navigation system. For a description of use, refer to the relevant operating instructions for the radio or navigation system.